Technology giant Google on Wednesday launched its new Chromecast and Chromecast Audio devices in India at Rs 3,399 each, more than six months after their global rollout. Chromecast is a dongle that allows streaming of audio and video content on a high-definition television or audio system via WiFi or a local internet network. Chromecast Audio is a device that can be plugged into speakers to stream radio podcasts and music. The devices and an updated app will make streaming faster and easier, Mickey Kim, Asia Pacific head for Chromecast partnerships, said at a press conference in Delhi. The new devices will work on Android phones, Chromebooks, iPhones, iPads and Windows laptops, the company said. The devices will be sold on online marketplaces such as Flipkart, Snapdeal and Paytm, as well as brick-and-mortar retailers such as Reliance Retail and Croma. 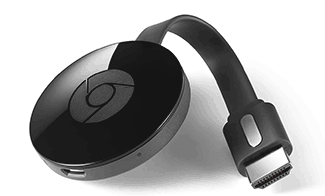 The Chromecast dongle has a new circular design. It can be plugged into the HDMI port on the TV and connected to the app over WiFi. The device also offers a new range of single- and multi-player games including 'Angry Birds Go' and 'Just Dance Now'. Both the devices will come bundled with six months of free subscription for video streaming service Hooq and music streaming service Saavn. Google claims to have sold more than 20 million devices since the Chromecast was first launched in 2014.